Where to go on the way home? The Olympic Torch Relay, was due in Barnard Castle that afternoon and we had already thought about a visit to Barnard Castle, so Barney it was. 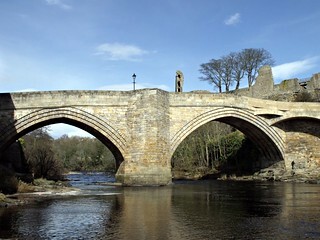 After another Full English breakfast (I must stop eating greasy food), we drove straight to Barnard Castle and as we were very early for the Torch Relay, we got parked down by the bridge, where we had intended to. From there we walked the long way, along the road up into the centre, where, after a quick look in the shops, we made for the tourist information to find out the Olympic flame's route. The route would take the flame up and down the high street so anywhere along there, would double the chance of a good view. We sat in the sun next to the castle for a while before getting board and going back to the shops, where I found several new beers but didn't want to carry them round all day. Dot got a snack while I went the the fish and chip shop for my lunch. It was still over two hours before the flame was due, so we went for a walk by the river Tees. It was a walk we had done twice before, so knew we had plenty of time. As we walked back up into town the crowds were building but we noticed that next to nobody had picked a spot on the old buttermarket. We knew the flame would pass there twice, so we claimed a space in the sun. 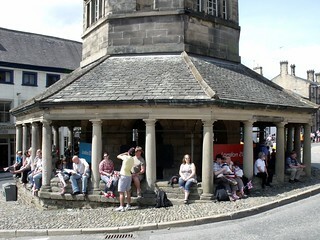 It was still an hour to go but we were sat in the sun with easy access to ice cream. 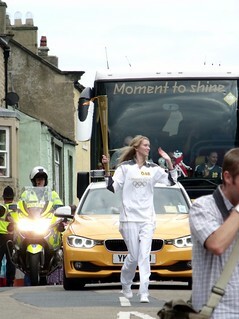 The police were very friendly and even entertaining, the sponsors buses also kept the interest up. Eventually the torch bearer came in to sight and the now very large crowd cheered, I was tacking photos and missed most of it. 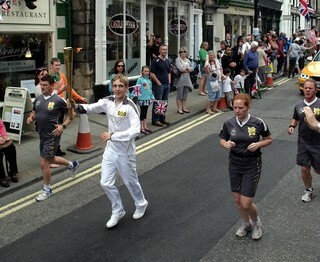 Afer a short while, a different torch bearer was coming back the other way and then all too soon it was all over. We sat in the sun next to the castle again and waited until the roads reopened and the traffic died down, before going back to the car. In the end, I forgot to go back for the beers I had found.